Continuing with my discussion about Google+ Communities, specifically with the Dear MYRTLE Genealogy Community. These discussions are about the earlier experience with the Google+ Community feature. Dear MYRTLE has moved to this platform as a way, or Genealogy Tool, to share our genealogy experience. 2 weeks into this new feature is talked about here. The real focus on this 4th of the series was about Private Communities. In our case, this may not apply. However, What IF you wanted to set up a Family Community or a Local Society Community? You may want to consider this feature. This discussion talks about should WE post to Google+ OR only Post into the Community. The panel talked about how they post. The best example should “I” just post to Google+ or not to post to Google+ but only into the Community. What I got out of it, is that the reason the panel uses the Google+ to gain people into their community. As I have followed DearMYRTLE, I see her on FaceBook and her Blog, and posting to the Community. That is my observation any way. In both the Google+ stream and from FaceBook, it’s getting the “word out there” that something is going on in the community. So, for this 5th video, it is talking about Posting Strategy for a community. They did touch on personal communities or “for business” communities. It was restated that the Community is Topic Focused. There was a work around, where there was a posting into one community, and sharing that post in the community into another community. I know that I have joined a couple of Genealogy Communities to learn what’s going on, but hadn’t thought about sharing some of those posts into the DearMYRTLE community. It does continue the thought about collaboration between communities. GooTubePlus in Google+ Communities. GooTube stands for Google and YouTube. The point of this next video is talking about the transition into the Community feature. It gets to the point from Part 5, that is, double posting, in Google+, to my own stream or circles or to the community. Let’s play nice in the sandbox. We respect your right to your religious and political beliefs, but this is no place for off-topic postings or Hangouts in this genealogy-oriented community. This is not a request. For organization’s sake, first click on the category that matches your subject. Then type your post, and tap the “Share” button. The post will be seen in “All Posts” and in the appropriate category. This 6th video opens a new topic, for individuals, for placing or bookmarking posts within a personal community, that is private and you can create categories to put those bookmarks. It will be interesting to see how that will work. Moving through another month, part 7 is at the 3rd month of communities. At this point in time, DearMYRTLE had moved from the Webinar platform to the Hangout On Air platform. So this next video talks about the communities are developing. I may be wrong, but what I have seen is more dialog. That started in the Hangouts On Air, both within the Joiners AND the Viewers. How DearMYRTLE is engaging the community during the Hangouts On Air. Now we are seeing discussions within the community on the topic of Genealogy. From what I have seen, is that the community is growing and sharing of our experience. This 7th edition talked more about things to consider when setting up a community, starting with the Title, and the About section for the community. How that information helps the Google search engine and the Google+ search engine “ranks” the results. Apparently these are two different sets of results based on where you search from. The activity within the community (Posts, Plus One, Shares) help raise the community for someone searching in Google Plus. One of the final comments from the Panel, was to create and participate in a private community. The 8th edition is here, on Permission Only Communities. This video talked about a Public Community, where someone has to be invited into the community. Chef Dennis had a vision for the community and focus for his topic. He controls who joins and even excludes who can join the community. As DearMYRTLE has done, Chef Dennis has clear guidelines as to who can and who can’t join the community. What was interesting, to me, is that he looks at the Profile of the person who is requesting to join the community. It’s like what I talked about on my blog post. That talked about how I choose who to add to one of my circles. So, for Chef Dennis, he bases that Tag line and Profile information as to who joins or doesn’t join his community. This should be the end of this series of blog posts on Google+ Communities. It’s been a great journey watch DearMYRTLE and working with DearMRYTLE in the establishment of the DearMYRTLE Genealogy Community. 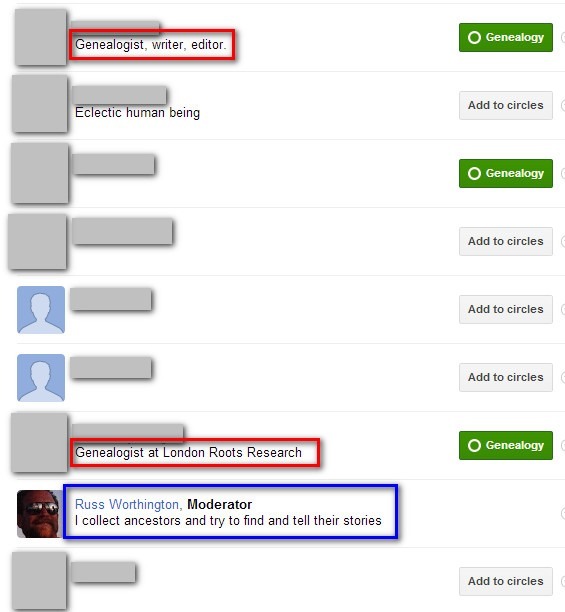 As some of you know, I have been involved with the DearMYTLE Genealogy Community on Google+. So, I thought I would take a moment or two to see if I can describe what a Google+ community is and why it may be important to those of use to do family history research. I have already benefitted, through sharing, from this relatively new “platform” to talk about genealogy. I will share the experience with the DearMYRTLE Genealogy Community, but I hope that those reading this blog post, that it is really another Tool, for our Genealogy Tool kit. Another online platform to use while doing our research. For example, the Hang Out feature to have a family gathering, on line, around the world, or just next door. What I got out of that YouTube presentation was that a community can be Topic Based. Certainly, that is what Dear MYRTLE has done for us. But what does that mean. If you have been using Google+, it is a stream of postings by other Google+ users. That users are those who YOU have decided to follow. That is your Stream of messages on Google+. If you follow 100 people, you will see what they post. The “next” level of posting is to a Circle. For example, I have a Genealogy Circle. Those folks that I ‘follow’, who are also interested in genealogy of family history research, I put into that circle. IF I have a message that is on the topic of genealogy, I will select that circle to post that message to. I have a Family Circle. The Family circle may not be interested in what I have to say about Genealogy. Another circle I have is on Headstones. The other two circles may not be interested in my headstone pictures. So, Circles are “private”. Only those in the circle that I post to, will see those messages. I can post to more than one circle, so I control who will see what I post. So what is different from a Circle (mine) verses a Community. You can join the community, if you find it. DearMYRTLE has a closed group, BUT, it can be found and you can ask to JOIN the Community. Two people monitor those requests to join, and you will be approved. One major difference is that Communities can be Searched and they are Indexed. Family Historians know what indexed and “can be searched” means. Each post, Each COMMENT, AND Each time you click that +1 ICON, helps get the Community to appear higher in the results using the Google Search Engine. A circle won’t do that. We have used Twitter as a genealogy tool. Don’t give up on that tool, as it is another useful genealogy tool in our tool box. But, unlike Twitter, Google+ communities are focused, and by replying to a comment or post, you can “continue the conversation”. I find it difficult just watching twitter, to pick up on a Hashtag. If I focus on ONE hashtag, like “ #genealogy ” I would miss out on the “ #genchat “. But a message in a community, such as the DearMYRTLE Genealogy Community won’t get lost. Oh, did I mention it’s longer then 140 characters. You will see, on the DearMYRTLE Genealogy Community, some categories on the left side. That focuses the discussion on specific topics, like Hang Outs. So, it’s topic based, within the community. The referred to YouTube video mentioned Not Competition with other genealogy communities, which are being created, but another place for cooperation, or as I have hear DearMYTLE say Collaboration. In the community, WE talk about what WE want to read about. Google+ would be everything, based on your circles or folks you follow, while the DearMYRTLE community is only talking about Genealogy. This second video talks a little more about how the information within the Community is “controlled”. Also, ALL posts, even published within a Category, the Community will see those posts. If you, the reader, wants to just look at Hang Outs, just look at that Category. The hint about “all of the emails” from the community, they suggest that you turn the Notifications (Bell ICON on the Left) OFF. As a moderator, I keep that ON because I want to see want to see the posts and comments. You may not want to see all of them. OR as we suggested in one of our early Hangouts On Air, Turn the Notifications OFF during the Hangout, the turn it back ON following the Hangout. One of the comments about growing the of Communities in Google+, was encouraging conversation within the community. Although I am retired, I need A Calendar, especially with all of the Online activities that are available for doing family research. I had been using Microsoft’s Outlook for years. Worked very well, but that would mean I had to be at MY computer. I tried many other applications including Google Calendar. It was OK, but had difficulty sharing it with my wife. My goal was a working calendar for me, and the ability to share it with my wife. This blog post will attempt to share how I manage my Calendar (singular). Let me start by saying that I have MY calendar. Thinks that I have scheduled. For example, today, I have a Genealogy Club that I find myself leading, and we are meeting for the first time. We are meeting at an Adult living center. I have 3 webinars on the calendar today, and a Genealogy Conference starts today. One of my sources for “things to do” is the GeneaWebinars calendar. It is a single repository (cool genealogical term) for members of the Genealogy Community to post their activities. I watch that calendar for new items, changes in an event, but I also “Follow” or “Join this site”. The Home Tab on that website talks about how to use it. But “following” that blog, I receive an email that something has been added, changed, or deleted. BUT I am not going to attend ALL of those events. There are so many great activities and I have so little time. Guess we know how that goes. Going to my Google Calendar, I can link the GeneaWebinar calendar to MY Google Calendar as a choice of calendars that I have. Lets start with a message that Pat Richley-Erickson posted on the Dear MYRTLE Genealogy Community recently (actually a few minutes ago). 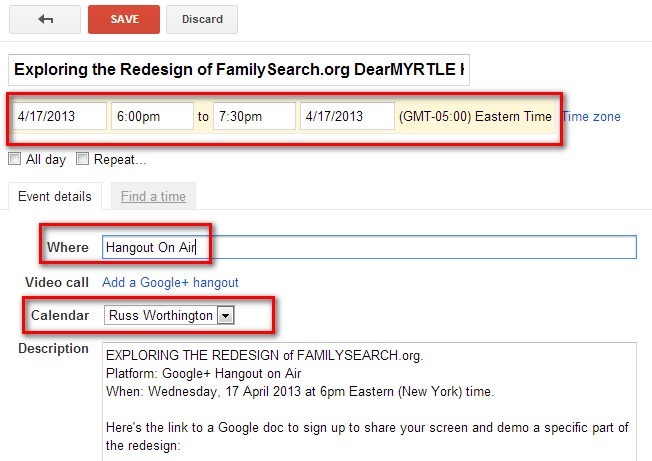 It’s a Google+ Hangout on Air, and it’s Wednesday, 17 April 2013 at 6pm Eastern (New York time). Now Dear MYRLE provides us a lot of great detail about this event. Question: Am I going to attend. This one is easy, OF COURSE I will attend. OK, how do I get this event to my calendar, that is the events that I am going to participate in or want on MY calendar. I head over to MY Google Calendar and SELECT the GeneaWebinar calendar. There is My Calendar and Other Calendars. I have NOT selected my calendar and have only selected the GeneaWebinar calendar. It’s color is Green and any event on that calendar will show. Not marked, but there is a light green event, which means that it has already pasted. Mondays with Myrt was held yesterday. Selecting this new event, the details of the event are appear. Be mindful of the Time and time zone. I want this event to appear on MY Google calendar. You will notice a “copy to my calendar” link. Clicking on that link will cause THAT event to appear on my calendar. 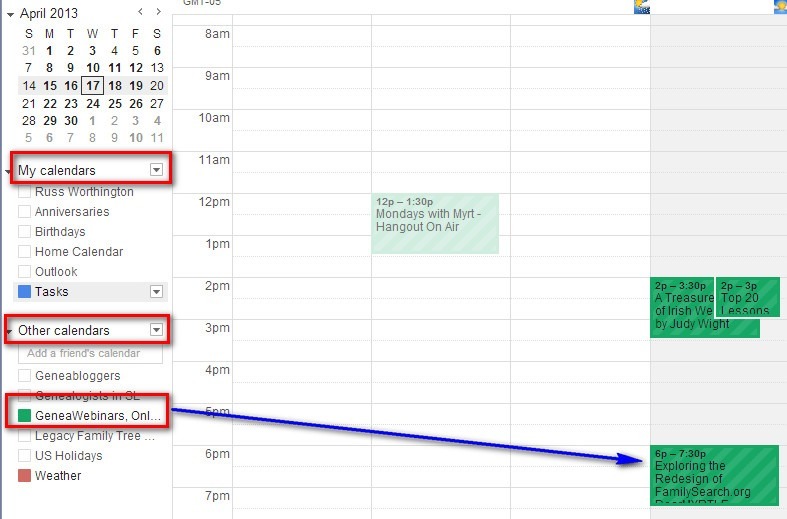 A page appears with the information from the GeneaWebinar page, like the date and time, that I entered “Hangout On Air” as a reminder for ME where this calendar event is going to take place AND that I have added it to MY calendar. This is a COPY of what was on the GeneaWebinar calendar. If this was an event, from another calendar, where there as an In Person Meeting, or that I had to travel, the Address, for example, could be added in the “Where” field. That was MY entry on MY calendar. If the “platform” of the event was a Webinar, the Go To Webinar platform has a registration page to sign up for the webinar. The Go To Webinar platform has built in Reminders that will send an email prior to the Webinar. I liked the reminders. 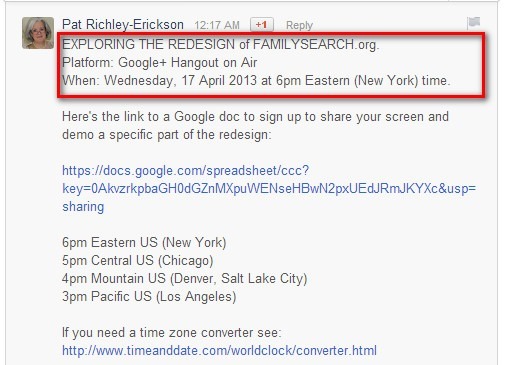 How to get those same reminders for this Google+ Hangout on Air? Scroll down to the bottom of what is on the copy of the event and I can ADD the reminders that I want Google to send to me, and HOW I want to be reminded. The Event Color, is the color of MY Google Calendar. I have set up so that I receive an Email 2 hours prior to the event, and Pop-up window on my computer 30 minutes in advance, and an SMS (Smart Phone Text Message) 10 minutes in advance. These settings are of my choosing, and I can have more reminders IF I need them. Like an Email 2 weeks prior to an event, IF I am traveling and want to be reminded that I need to get ready for the event. 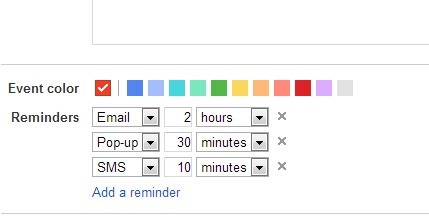 The default setting from some events, from Google Calendar, is 10 minutes for all 3 ways to be reminded. Email, Cell Phone, Pop-up windows are gentle reminders that something is coming up very soon. That’s OK for some events, especially online events, to get me in front of the computer. I save that new event to My Calendar. 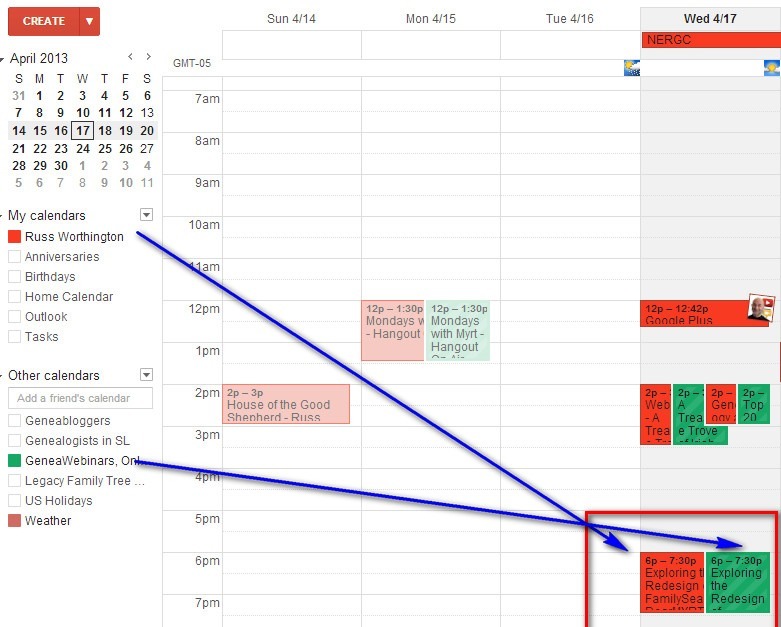 When I saved that event, I was returned to My Calendar where I selected MY Calendar (in RED), so now I am showing the GeneaWebinar calendar and MY calendar. Oops, looks like I have a conflict just above the hi-lighted event. I have a choice to make at 2PM. Two webinar. I did that on purpose because I am interested in Both but may not make up my mind until the last moment. I can now go back and de-select the GeneaWebinar calendar, just by clicking (with my mouse) on GeneaWebinars on the left. This is a view of of my calendar. Clicking on any of them, will give me details of what I entered or what came from the the “other” calendar. This is great for me. I can see what I have scheduled for the day. During one of Dear MYRTLE’s presentations, she and her daughter of Not Your Mothers Genealogy, introduced, to me, an application called Cozi. It is also a calendaring program (Oh no, another program). I didn’t use it too much because it was “another calendar” to maintain. It is great for sharing information with the family, but more work. HOWEVER, this application has the ability to link my Google Calendar to my Cozi Calendar. 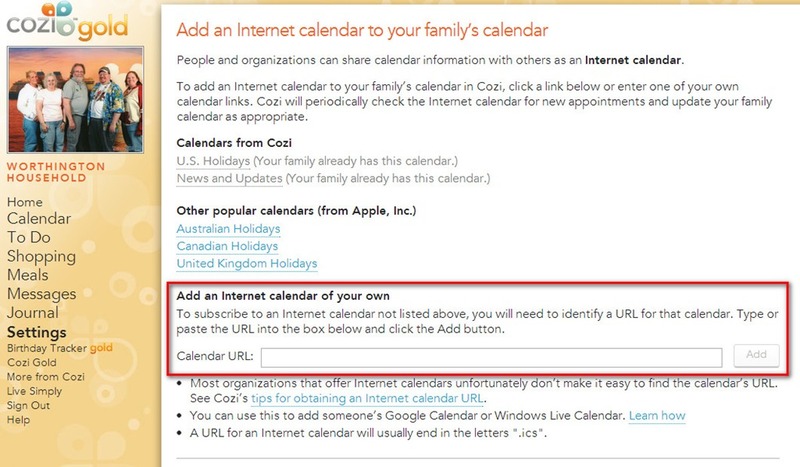 In the Settings menu, on the Left, there is a Calendar URL that can be pasted from my Google Calendar, under Share Calendar, Calendar Details, Private Address, iCal, has the link for the Calendar URL. After saving that calendar, now my Cozi calendar has my Google Calendar entries. 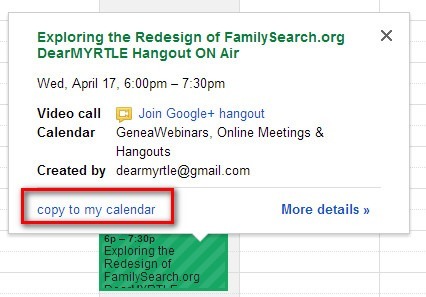 About 10 minutes after I added this Dear MYRTLE Genealogy Community, to GeneaWebinar calendar, to My Calendar (copy), this new event is on my Cozi Calendar, with all of the reminder coming from my settings in Google Calendar. Sounds like a lot of work, but I maintain ONE calendar, I can share that ONE calendar, AND I have all of the reminders that I want of an upcoming event. Should we join Google+ ? 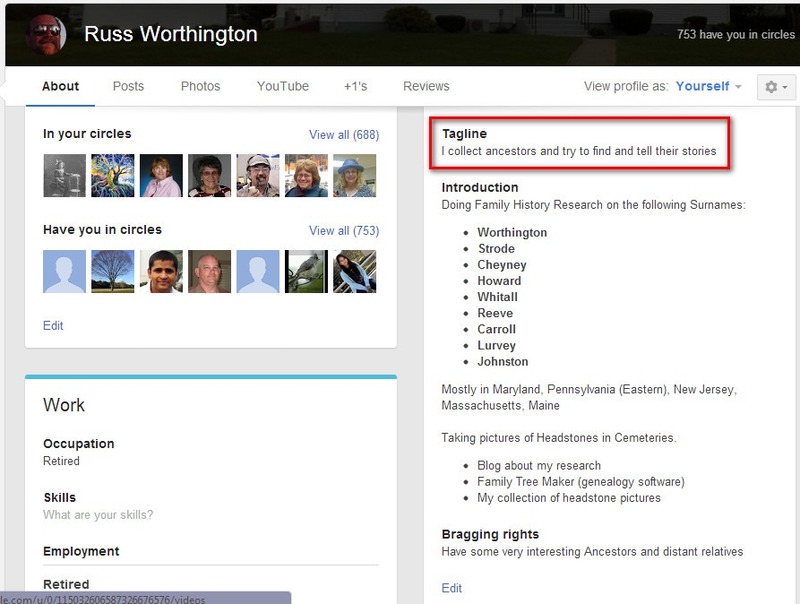 Should Google+ be in our genealogy tool box? Can we find new cousin’s or family historians on Google+? I have been on Google+ for a while. I enjoy reading the folks that I follow, when they post information on Google+. I have created several Google+ circles. Not my topic today, but why do I add people to one of my Circles? So that I can follow them. The common interest for me is Genealogy or Family History Research. So, over time I have a number of people in my circles. Recently, Google+ created “Communities”. 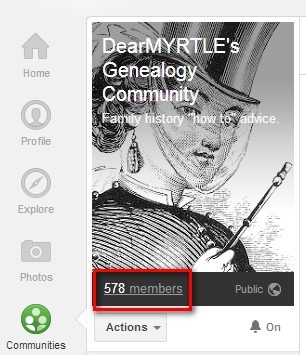 I belong to a number of them, but my favorite is the Dear MYRTLE’s Genealogy Community. The community continues to grow, but am I interested in adding any of the members in that community to my one of my circles. I don’t know about you, but I have a limited amount of time reading every post that is made, so I limit the number of people I add to my circles or that I follow. In the Dear MYRTLE’s Genealogy Community, I look at the member of that community and see who might have the same interests as I do. How WE are presented on Google+ becomes important here. Rather then write about it, let me show you. You will see the list of the members in this community. Clicking on the link called members you will see a list of the members, with a small bit of information about that person. I have blanked out the names of the people and their image, as that isn’t important, What IS important, for me at least, is the information that is just below their name. Mine says “I collect ancestors and try to find and tell their stories”. The wording isn’t important, but I do have (at least) two interests, and they are the main reasons that I am on Google+. But the limit in the number of words needs to be understood. What key words are YOU looking for. The first example says “Genealogist, writer, editor”. Genealogist got my attention. The 2nd one that is in red also has Genealogist. I have added both to my Genealogy Circle. The 2nd person in my Genealogy circle is someone who I know, but hasn’t put anything in the field that I will show next. This could be gardening, quilting, playing bridge, photography, etc. When someone puts you into one of their circles, you will receive a notice of that happening. I just don’t accept or just follow that person, I will click on the link for in the email, and look at their Tagline. If it’s blank, chances are, that is as far as I go. BUT, look at what else you can include IF someone checks your About page. My surname list is there as well as some location’s that I research. For me, the Tagline gets my attention, or not, then I can dig a little deeper to see what else is on the About page. It’s a great place to share your surnames and/or locations. What does your Tagline say? What else do you have on your About page?